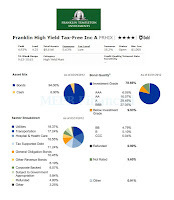 This Franklin High Yield Tax-Free Income fund is part of high yield municipal bond mutual fund. It invests in non-investment grade muni bonds and its income is exempted from federal tax rate. The investment objective of Franklin High Yield Tax-Free Income fund is to provide investors with a high current yield exempt from federal income taxes and capital appreciation. This mutual fund normally focuses its investment in securities whose interest is free from federal income taxes and alternative minimum tax (AMT). The fund may invest in municipal bond rated in any rating category. This Franklin Templeton fund has total net assets of $8.61 billion. It is currently managed by John Wiley. He has been managing this municipal bond fund since December 1991. Its annual expense ratio is 0.63%. This fee is lower than the average fee in the High Yield Muni category which is 1.02%. The 12b1 fee is 0.10% and the maximum front-end sales load is 4.25%. This best municipal bond fund has yield of 4.93% for the past 12 months. The most recent dividend was distributed on April 20, 2012 in the amount of $0.04. In April, Franklin High Yield Tax-Free Income Fund will adjust its dividends as follows: Class A from 4.05 to 3.80 cents per share; Class B from 3.54 to 3.29 cents per share; Class C from 3.54 to 3.29 cents per share; and Advisor Class from 4.14 to 3.89 cents per share. Dividends may vary based on the fund’s income. Morningstar has ranked this best high muni bond fund with 4 stars and Gold rating. Based on load adjusted return, the fund has returned 11.89% over the past 1-year, and 10.79% over the past 3-year. This fund has 21 years of positive return with the best return in 2009 with 27.74%. The 5-year average return is 4.69%. If you are interested you invest with a minimum initial investment of $1,000 for brokerage account. For retirement (IRA) account, please check with your administrator. You can buy this mutual fund from 94 brokerages, such as JP Morgan, Edward Jones, Vanguard, Merrill Lynch, E Trade Financial, Fidelity Retail Funds Network, TD Ameritrade Inc, Morgan Stanley Advisors, etc. As of April 2012, the top sectors in its assets are Utilities (18.37%), Transportation (17.24%), Hospital & Health Care (16.55%), Tax Supported Debt (11.24%), General Obligation Bonds (10.45%) and Other Revenue Bonds (10.45%). The asset mix is Bonds (94.00%) and Cash (6.00%). Investing in this top muni bond mutual fund involves risks such as Interest rate risk, Market risk, Credit risk, High-Yield Debt Securities risk, Income risk, Prepayment risk, etc.